These were super fun to make and made a great party snack food in lieu of boring meat and cheese pinwheels. Plus they are loaded with vitamins and flavor! It’s also a great way to use up left over grilled veggies! Layer (1 layer each) a whole wheat wrap with kale-walnut pesto, slices of grilled squash, peppers and onions and provolone cheese. Fold in the sides of the wrap, and roll very tightly all the way to the end. Let sit in the refrigerator for an hour. 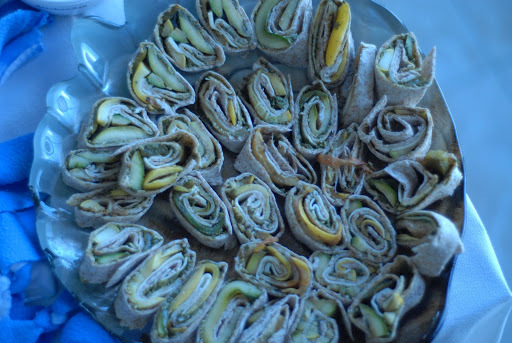 Slice wrap into bite size pinwheels!